Automatically remove formatting from text copied to clipboard. Is there a better alternative to Unformat Clipboard? 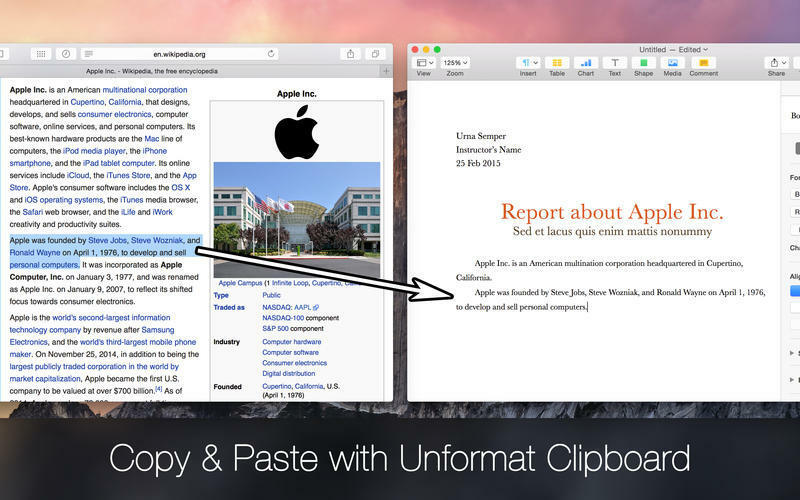 Is Unformat Clipboard really the best app in Word Processing category? Will Unformat Clipboard work good on macOS 10.13.4? Unformat Clipboard solves a wildly known problem with copy and paste on the Mac by automatically removing formatting from text copied to clipboard. When you copy text from a website or a document the formatting (font, color, style, etc.) of the text also gets copied. When you paste that text into a document like a report or eMail you are writing you manually have to reformat the pasted text in order to fit the formatting of your document. This takes a lot of time and is pretty annoying if you do it regularly. Unformat Clipboard needs a rating. Be the first to rate this app and get the discussion started! The solution is here: Unformat Clipboard does the job for you! And best of all: with a single click or by hitting ⌥⇪C you can activate and deactivate Unformat Clipboard.